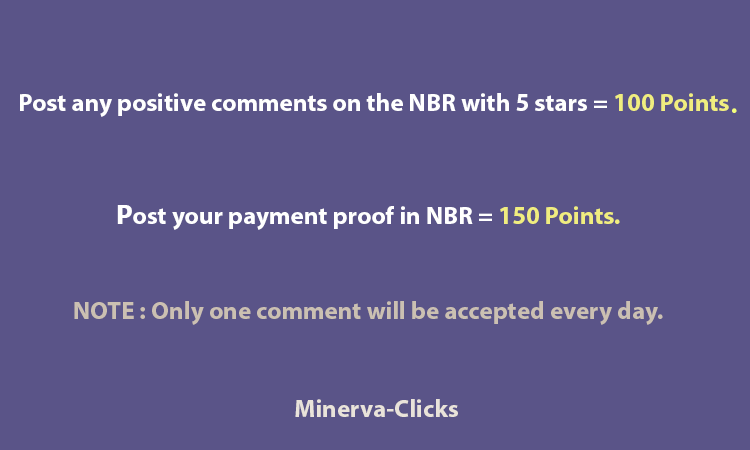 Forum minerva-clicks → Payment proofs → Earn extra points by posting proofs → Earn extra 250 points! Spammers and fraudsters are attacking Our Page In NBR every day and reduce our rank. I am alone and I need your support. We decided to give you the chance to earn extra points by sending comment and posting your payment proof in NBR. We review it every day and add the following prizes to your account. NOTE : Only one comment per person will be accepted every day.
" Please do not post negative comments on other sites "
Prizes will automatically be added to your account after your post. Anyone who does, will receive bonuses instantly.